Last week we wrote about three common types of crushers that one might find in construction or mining. Here are three more common types of crushers and a little bit more information about how they differ from one another. The hammer crusher lays the hammer, both figuratively and literally. The crusher of this powerful machine consists of a many small hammers connected to a central rotor that spins, sending the hammers to the edges with substantial centrifugal force. Product feeds into the crusher from the top and is pulverized between the hammers and inside casing. Then, when reduced to the desired size, material falls through the bottom to be collected. The name really justifies the machine when it comes to the Impact crusher. This machine makes use of impact as opposed to compression to crush materials. You put the materials to crush into a cage with openings that meet the thickness requirements that you have. The crusher then spins, with beats pushing material toward the inner services and compressing it to fracture to smaller sizes. Materials then pass through the bottom or sides of the cage when they are small enough to fit through the gaps. Impact crushers are typically used for softer materials that can be crushed easily by the rotor and beaters. The roller crusher breaks materials by squeezing them between two metal rollers. This reduces material to a width equal to the space left between the two rollers, which can also be adjusted as necessary. Both cylinders are usually covered with a very strong manganese steel liner to protect them and ensure the roller does not deform from any of the material being crushed. Typically, Roller crushers are used to compress fine or small materials, and may commonly see use as a secondary or tertiary crushing step. 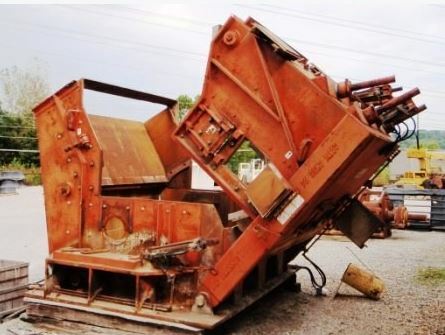 Rackers Equipment carries a wide variety of new and used crushers for sale, perfect for any project you may have. Browse our inventory of different primary crushers and secondary crushers online now or, for help finding the crusher that you need, call us today at 573-635-8700.